The﻿ Clarke Historical Museum﻿ celebrates the anniversary of the driving of the Golden Spike which completed the Northwestern Pacific Railroad. Attended by a large crowd filled with dignitaries from throughout the state, the gala event marked the completion of an arduous five-year long project to build a rail line from Eureka to San Francisco. Thursday, October 23: 5 p.m. – 10 p.m.
Join the Clarke Museum for a delicious catered meal at the historic Eagle House. Relive 1914; come in period costume to really get in the spirit. Enjoy historical reenactments, vaudeville performances, ragtime music, dancing, and watch the original film celebrating the completion of the NWP line. Don’t let the fun end after dinner; special room rates will be available for guests! Stay the night/weekend at the Eagle House Inn – an 1880’s restored Victorian with modern amenities. Tickets for this fundraising event are available at the Clarke for $75. Get your tickets now, as this event will sell out! 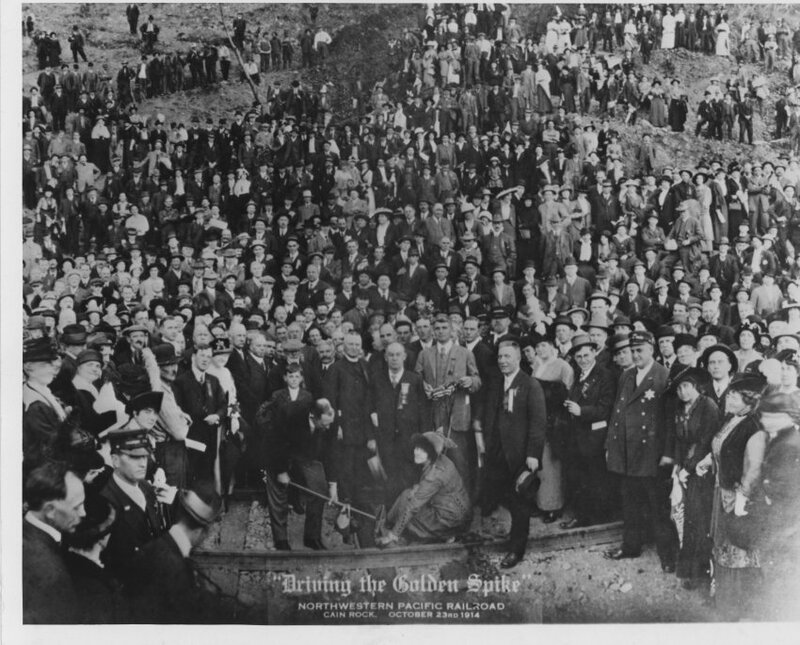 Friday, October 24: 4 p.m. – 8 p.m.
Don't miss your chance to see the original Golden Spike, which will be on display for one night only, from 4-7 p.m. The Native Sons of the Golden West and railroad enthusiasts will honor the Clarke Museum with the dedication of a special plaque commemorating the centennial of the NWP line. The dedication will be complemented by a presentation from Dr. Alex Service and Susan J.O. O’Hara titled, “ NWP: Construction, Tribulations and Celebration”. A book signing of their new work Northwestern Pacific Railroad: From Eureka to Willits will follow with specialty cocktails available. All of Friday’s festivities will take place at the Clarke Historical Museum in Old Town where you can be the first to view our exhibit commemorating this historic event. Saturday, October 25: 11 a.m. – 4 p.m.
Saturday is sure to be fun for the whole family. Take a ride on a speeder car and view the Falk locomotive as Timber Heritage brings their trains to the Clarke Museum. Come learn about early railroad history and enjoy a street fair in Old Town, Eureka as we continue the celebration. The museum will be open so come inside and browse the exhibit.